The Melbourne Cup has been won and run for 2015. Congratulations to the owners and connections of Prince Of Penzance on their victory. See below for dividends and the complete finishing order. The stewards have interviewed jockeys about interference near the end of the race, but this will not change the outcome of the race. Frankie Dettori has been suspended for one month and fined $20,000 for “careless riding causing interference” during his ride on 2nd place getter Max Dynamite. Jamie Spencer has also been suspended for 14 race meetings due to interference he caused at the 250m mark while riding Big Orange. Meanwhile Red Cadeaux suffered a suspected fetlock injury to his left foreleg during the race and has been taken away for urgent veterinary assistance. The injury is not believed to be too bad, but may spell the retirement of the 10-year-old horse. Full replay, and data such as sectional times and margins etc are available on Racing.com’s 2015 Melbourne Cup page. Note free registration is required in order to view replays. Replays only available in Australia. Well, as usual my Melbourne Cup tips were an unmitigated disaster. As Melbourne Cup day attracts a large number of people who have a bet on this day and not on any other day, the following information may be of use to some people. Which prize amount on the TV did I win? UBET (formerly known as TattsBet and still listed as such in some places): Queensland, South Australia, Northern Territory, Tasmania. To add confusion to the mix, UBET/TattsBet offers betting services to people outside its four TAB states. If you’re using a Tatts or UBET account but don’t live in one of those states, then their odds are irrelevant to you as you are using their bookmaker service and will need to consult UBET for the relevant odds. If you are not betting through a TAB but through an online bookmaker, then you will need to consult them for details of your odds. Most online bookmakers offer a number of odds, some are “fixed” which means they don’t change from the time you place the bet, and others will be tied to one or more of the TAB odds. Take note of the type of odds you are choosing when you place your bet, and you’ll be in a good position to know what you won if your horse or horses finish in a winning position. Which television coverage should I watch? As noted earlier today, both Channel Seven and Racing.com (channels 78, 68, 522 on Foxtel, and online) have full coverage of the race. If you have the choice, I recommend the Racing.com coverage on the basis that they are spending less time playing with silly camera angles on cars which make it difficult to see the horses, and are not adding unnecessary audio from the side of the track of horse hoofs pounding on the ground, and so the commentary is clearer, which makes it easier for you to follow your horses. What are all of these types of bets? Exacta: Pays if the two horses finish first and second. You must nominate which horse will run first and which will run second. Trifecta: Pays if the three selected horses finish first, second, and third. You must nominate which horse will finish in which position. Other bet types have various names with various outlets, and the rules vary slightly between betting outlet, so if in doubt you should consult your betting agency for further information. Another year, another Melbourne Cup, although this year there are some interesting changes to the ways you can watch the Melbourne Cup which will be of great benefit to people who can not be near a television. As usual, after the race I will provide complete results (including the complete finishing order) and the TAB dividends. It should be noted by prospective gamblers, given the number of people who may only bet on Melbourne Cup day and not be aware of all the ins and outs of horse racing, that bookmakers (which includes most of the online betting agencies) may offer different odds to those of the TABs…so the figures you see in the media may not match the odds on offer by your chosen betting outlet, and you should take this in to consideration before placing your bet. At the time of publishing there were no scratchings. If this changes during the day, I will update this post, but not until the afternoon. The race starts at 3pm Melbourne time (UTC +11). The usual places on television and radio will be carrying the race, but with an extra television station and extra online viewing options to throw in to the mix. This makes the 2015 Melbourne Cup the most accessible Cup in history. The Seven Network (through Channel Seven in capital cities; Seven Queensland in regional Queensland; Prime7 in regional NSW, ACT, and Victoria; GWN7 in regional Western Australia; Southern Cross Television pretty much everywhere else) remains the primary broadcast partner and will be running coverage pretty much all day, however this coverage is likely to be less focussed on racing this year and more focussed on the ancillary stuff such as fashions on the field and various associated social events. Seven will still cover the race and all of today’s other races at Flemington, but is likely to produce a broadcast aimed at more at the casual viewer than the fan of horse racing. This is because Seven has an agreement to air another racing channel. Racing.com (channel 78 in metropolitan areas and most of regional Queensland, channel 68 in other regional areas, channel 522 of Foxtel, and also online…see below) is Victorian Racing’s own channel, broadcast through an agreement with the Seven Network and regional affiliates. The station offers a more thorough coverage of Victorian horse racing than that of Seven and is probably of more value and interest to people who are actually interested in horse racing, although it will also be a busy day for this channel as it will also be covering racing in Echuca, Wangaratta, Bairnsdale, Mildura, and Mansfield, however this won’t compromise coverage of the Melbourne Cup in any way as all of these other race meetings will take a prolonged break at 2:30pm. It is also worth noting that in most locations the Racing.com broadcast is at least a couple seconds ahead of the Seven broadcast, and in areas served by Prime7 and GWN7, Racing.com can be as much as 20 seconds ahead. 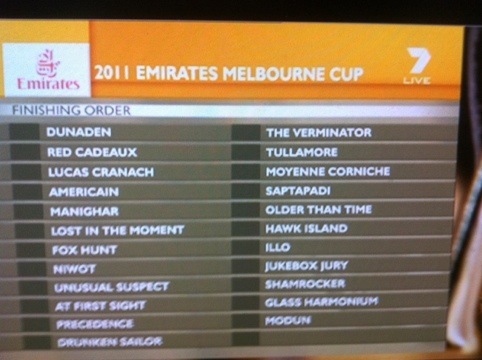 The big change this year is that live vision of the Melbourne Cup will be available online. Racing.com is undoubtedly the best place to go for this, however to access their stream you will need to register for a Racing+ account. This is free, but not something which you would want to do at the very last moment. Racing.com’s stream will be available worldwide. It is the only live stream of the Melbourne Cup which will be available outside Australia. Channel Seven will also stream the Melbourne Cup live via 7live.com.au (where a Racing.com stream is available in addition to Seven’s coverage) and also via the Plus7 app. However these streams will only be available within Australia. Various online bookmakers offer a relay of the Racing.com stream through their own apps and websites to account holders. These streams will only be available within Australia. These betting agencies include: tab.com.au, Sportsbet, Crownbet, Ladbrokes, Betstar.com.au, bookmaker.com.au. Very little has changed in regards to radio coverage this year. Many radio stations across Australia will take coverage of the race and some overseas will as well. I don’t have details for non-Australian radio stations, but the chances are that if you are outside Australia and have a station which regularly covers horse racing, it will probably cover this race too. Canberra: Sky Sports Radio 1008AM. (Note: ACTTAB used to run 88.7 FM, however Tab Corp have bought and dropped the ACTTAB brand, and I can no longer receive a signal on 88.7FM, although it was never good in my part of town so might still be operational). This stream can also be accessed from RSN’s website rsn.net.au and from Racing.com. This stream will get very busy, so if you can’t connect to it or have other problems with it, the other racing stations are your next best bet. Sky Sports Radio: http://www.skyracing.com.au/index.php?component=content&Itemid=215&id=96 (and the old lower-quality stream is still available http://www.skyracing.com.au/index.php?component=content&Itemid=121&id=97). Both require Flash player. WA TAB: https://www.tabtouch.com.au/RRLive (to play in a browser with Flash Player) or http://racingradio.rwwa.com.au/live to directly play the MP3 stream. (The stream was silent when I checked it this morning, although given the local time in Perth at the time, it could have just been an overnight technical fault). 2GB in Sydney also usually take the race and have a decent capacity for listeners on their stream, so if none of the above work for you, then http://www.2gb.com/listen-live will probably get you the race. The above stations are all also available via phone apps such as Tunein Radio. Racing.com will have the replay of the race, however it will only be available within Australia, and requires registration (the same registration as their live stream). Seven will undoubtedly replay the race many times during the day and Racing.com’s TV station and webstream will replay the race many times during the overnight replays over the next few days. The closing stages will be replayed by most television news bulletins in the 24 hours following the race. Best of luck for the race today. I hope you have a good day and remember to have fun but only gamble what you can afford to lose. As usual I will be back this afternoon around race time with all of the results. It’s Melbourne Cup day again. I gave the Melbourne Cup a miss on this blog last year, but I’m back this year and will provide my usual results service including the full finishing order of the horses after the race, which is often useful for the sweeps where a prize is offered for last place (or in some unusual sweeps, one of the other places in the middle of the field somewhere) and is also of some importance this year with some online betting outlets offering a prize for correctly picking the first ten horses in order, the odds of which are astronomically difficult and it deserves a larger prize than is being offered, but with a prize of over a million dollars on Melbourne Cup day, I can see why it would be tempting. I’m not going to attempt to pick the first ten horse in order, but I will give you my top three. I like horse number 12 “Who Shot Thebarman”. Not the most consistent recent form, but with a decent barrier (13) and ridden by Glen Boss, I think he stands a good chance. He has won previously over this distance which is also a plus, and his last two victories were at this track with this jockey, although as a six-year-old there are definitely some more young and spritely horses in the race, but I’m happy to select Who Shot Thebarman as my top pick. The other two horses I like are number 15 “Precedence” who I don’t think can win but I can think can run a place, and number 20 “Opinion” who, like Who Shot Thebarman, is trained by C.J. Waller. The Melbourne Cup field is currently now down to 22 horses due to the early scratching of number 6 “Sea Moon”, and the subsequent scratching of number 2 “Cavalryman”. The Seven Network is the official television broadcaster of the race which starts at 3pm Melbourne time (2:30pm in South Australia, 2:00pm in Queensland, 1:30pm in the Northern Territory, and 12:00pm in Western Australia) and you can be sure it will be shown on a television in every TAB and most clubs and function venues in the country. For those who can’t be near a television, many radio stations will be covering it. Your local racing station will definitely have full coverage and a bunch of other stations will be taking the coverage for at least the race, if not some of the pre-race and post-race coverage. WA TAB: https://www.tabtouch.com.au/RRLive (to play in a browser with Flash Player) or http://racingradio.rwwa.com.au/live to directly play the MP3 stream. If you’re having a bet today, then best of luck to you, and remember to gamble responsibly. I’ll have all of the results this afternoon following the race. Not too bad I suppose. First and last is an interesting result. 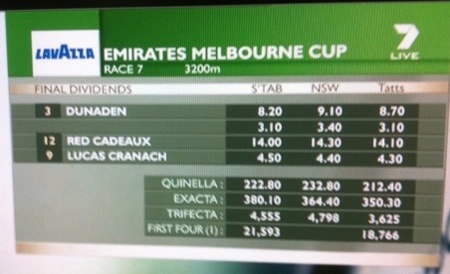 Obviously I didn’t win the quinella or the trifecta, but with those odds the win and place paid reasonably well. I hope your tips went well. It’s that day of the year again…alas this year I won’t be able to provide as full a coverage as I have in previous years due to my own work commitments, however I will keep you updated as much as I can throughout the afternoon, including the full finishing order of every horse. The Melbourne Cup will be, as usual, live on the Seven Network across Australia, however if you can’t get to a television, there are plenty of radio stations covering the race, both on the air and online. You could twiddle your radio dial at 3pm to find a station which is covering the race, or if you want some webstream links, Sky Sports Radio (formerly 2KY) can be heard at http://www.skyracing.com.au/media/playerv2.php (requires Flash Player). Sport 927 in Melbourne have a Windows Media webstream at http://www.radiosportnat.com.au/sport927.asx. 2GB in Sydney are covering the race in Windows Media, MP3 (compatible with most players such as Quicktime, Real Player, VLC etc) and via their website. 2CC Canberra are also covering the race in Windows Media format. Good luck with the races today. Normally I’d do this a lot earlier in the day, so if you’ve been waiting all day to see who I’m tipping so that you can avoid them at all costs…well hurry to your preferred betting outlet now! Spin Around finished in 20th place. On the bright side, I did slightly better than Maritz. Fiumicino was 22nd past the post. This story is now complete. Final update 3:47pm. Correct Weight has been declared at 3:19pm. All dividends are final and are now paying.